In these cases, attitude is very closely linked to trajectory (in two dimensions, anyhow). This technique is not sufficient for measuring attitude under more complex dynamics, though, or where velocities are so low that measurement uncertainty masks the signal of interest. Consequently, a practical attitude-determi­nation system requires additional sensors. GNSS receivers can be tightly integrated with inertial measure­ment units (IMUs) to form a combined GNSS/INS (GNSS/iner­tial navigation system). In these systems, the IMU provides rapid angular rotation and acceleration measurements, complement­ing the absolute accuracy of the GNSS positions. A GNSS/INS implementation can take advantage of the strengths of each type of system to provide accurate, continuous solutions for applications involving high dynamics, frequent GNSS signal outages, and other operational and environmental factors. Certain aspects of GNSS/INS can prove challenging for some applications, however. One particular challenge is that the orientation of the IMU with respect to the GNSS antenna must be accurately known and typically must remain fixed. This is appropriate for an installation on a rigid body, but proves chal­lenging when considering a body with independently moving parts (such as a skydiver). Another solution suitable for applications with good sky vis­ibility involves the use of multiple GNSS receivers with antennas at different locations on the vehicle or body. Geometric analysis of the vectors between the independent points can yield attitude information. With two receivers, two attitude dimensions can be measured (e.g., pitch and yaw), while a third receiver adds full three-dimensional attitude determination. 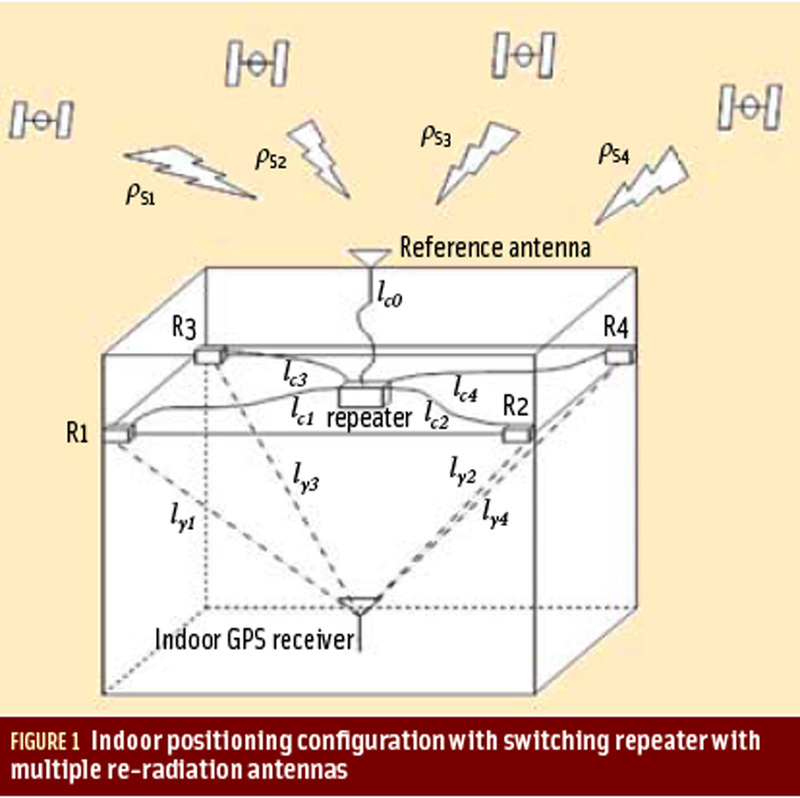 Accuracy of a GNSS-only attitude system depends on the geometry of the antenna array, measurement accuracy, and the baseline computation technique. If we take it as a given that antennas are oriented and spaced to provide good geometry, the performance comes down to the accuracy of the baseline com­putation technique. The simplest baseline computation is done by differencing the positions reported by two antennas at the same time, and computing the vector between them. The resultant angle and baseline accuracy depend partly on the inter-antenna spacing (angular estimates will improve for longer baselines) and partly on the solution accuracies themselves. The foregoing equation is not really accurate because it accounts for full two-dimensional error, while only the error perpendicular to the baseline is of concern; it does, however, provide a good “order of magnitude” estimate. Using the same approximation on a shorter baseline of 10 meters — a small aircraft’s wingspan, for example — that same heading error increases to nearly 14 degrees. The problem is magnified on even shorter baselines until, at some point, the vector is meaningless. Clearly, further refine­ment of the individual solution accuracies is needed for short baselines. If receivers can be operated in a dual-frequency real-time kinematic (RTK mode), individual solution accuracy can be improved to the range of one centimeter or better, assuming a relatively short distance to a reference base station. With such accuracy, we can now theoretically achieve a sub-degree head­ing accuracy over a baseline as short as one meter. In fact, even as distance from a fixed base station increases, this heading accuracy would not degrade significantly on short-baseline installations because errors would remain highly cor­related on the installed antennas. At very long distances from base stations, though, integer ambiguity resolution becomes less reliable and increases the probability of a large blunder affecting position accuracy. Although the accuracy from a dual-RTK setup is attractive for many applications, there is a significant drawback to using RTK in such a system: it requires a fixed base station installation somewhere, and for this base station to be in communication with all receivers installed in the attitude-determination system. Furthermore, each receiver must be in communication with a central processing system that reduces raw positions to atti­tude vectors. These communication links could be either com­plex to install or completely unavailable. There is a way to achieve the RTK-level of heading accuracy without a base station. NovAtel has developed an RTK-based “moving base” solution that greatly simplifies the task of deter­mining heading and baseline from multiple GNSS receivers. As compared with the dual-RTK method described earlier, this proprietary design has some clear advantages. First, the base infrastructure (i.e., fixed base station) and communications requirements are markedly reduced. determination), receivers can operate in a single-point mode with no need for ground-based differential corrections. Addi­tionally, the NovAtel system’s computations are done on-board the Rover receiver with native firmware features, eliminating the role of a central processor to accomplish that same task. The second advantage to this moving-base solution is less obvious: an inherent increase in heading/baseline accuracy occurs when using it as opposed to a dual RTK solution. In a two-receiver setup, the dual-RTK method involves two indepen­dent baselines (Base – Rx1, Base – Rx2) with an associated inac­curacy for each baseline. Differencing these two positions could double the inaccuracy in some circumstances. Conversely, operating those same two receivers in the mov­ing-base mode computes only a single baseline (Moving Master-Rover), and usually that will be a shorter baseline than in an RTK setup (Fixed Base-Rover).